By the mid-1800s, nearly 90 ships had wrecked themselves on the rocky shores off Point Montara, 25 miles south of San Francisco. Two wrecks, in 1868 and 1872, were so tragic that Congress finally decided to take action by commissioning a light station. The first light at Point Montara was a simple red lantern hung on a post in 1900. A dozen years later a skeleton tower was erected here and finally in 1928 this 30-foot cast iron lighthouse was installed. Last year a startling discovery was made about this lighthouse. It was uncovered that the lighthouse was much older than was previously know. It was revealed that this lighthouse had been built in 1881 and first erected on Wellfleet Harbor in Cape Cod, Massachusetts, where it served until in 1922. It was then decommissioned and transported 3,000 miles to San Francisco where it was put back into service at Point Montara. 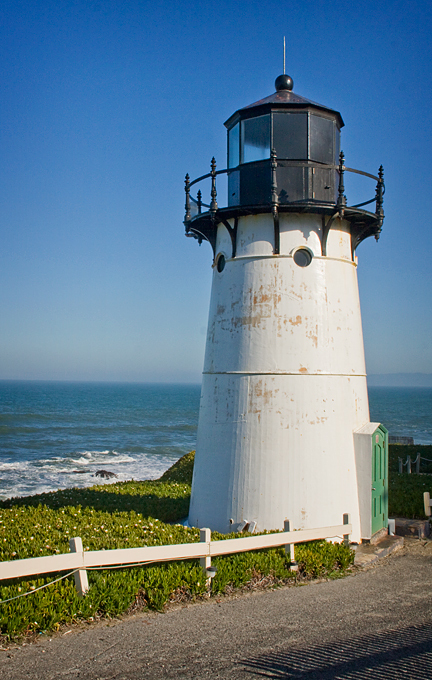 To date, the Point Montara Lighthouse is the only known lighthouse to have stood watch on two oceans.